- As a correspondent for ITN's News At Ten and the BBC's Panorama program (covering wars and conflicts wherever they were taking place in the world). - As a researcher and author. (His first book Arafat, Terrorist or Peacemaker? was published by Sidgwick & Jackson in 1984 and subsequently in several updated editions over a decade). - As a participant at leadership level, working to a Security Council background briefing, in the covert diplomacy of the search for peace. 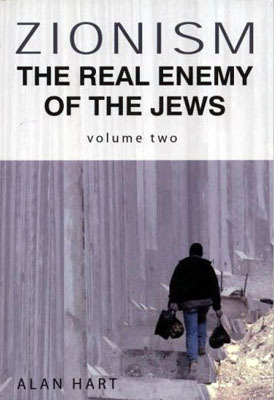 Alan Hart thus brings to the pages of his latest book, Zionism: The Real Enemy of the Jews, and to the debating chamber, a deep understanding of why, really, the Countdown to Armageddon is on and how it can be stopped. He has been to war with the Israelis and the Arabs but the learning experience he values most, and which he believes gave him rare insight, came from his one-to-one private conversations over the years with many leaders on both sides of the conflict. With, for example, Golda Meir, Mother Israel, and Yasser Arafat, Father Palestine. The significance of these private conversations was that they enabled Alan to be aware of the truth of what leaders really believed and feared as opposed to what they said in public for propaganda and myth-sustaining purposes. Alan has long believed that what peacemaking needs above all else is some TRUTH-TELLING, about many things but, especially, the difference between Zionist mythology and real history, and, the difference between Judaism and Zionism and thus why it is perfectly possible to be passionately anti-Zionist (anti Zionism's colonial enterprise, that is) without being in any way, shape or form anti-Semitic. The mother and father of all questions concerning US intentions for the Middle East (of British terminology) and Iran is this: Who, really, calls the policy shots? In the “expert” community this is known as the “tail v dog” question. The full version of it is this: Is it the tail of the Zionist state and its awesomely powerful lobby in the US that wags the American dog, or does the dog wag its tail? In my analysis, which is shared, for example, by Ilan Pappe, Israel's leading “revisionist” (which means honest) historian, the answer is that it's mainly the Zionist tail that wags the American dog. 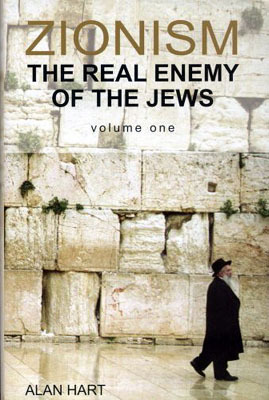 As I demonstrate in my epic, two-volume book, Zionism: The Real Enemy of The Jews, it is a fact that, with the arguable exception of Lyndon Johnson, every American President, including the idiot in the White House at present, tried to draw red lines that Israel should not cross; and on most occasions Israel put two fingers up and crossed them. - the use of the obscenity of the Nazi Holocaust as a blackmail card to silence criticism of Israel and suppress informed and honest debate. (On this front the Zionist lobby is assisted by the fact that, out of fear of offending Zionism, the mainstream media in America and throughout the mainly Gentile Judeo-Christian or Western world is complicit in Zionism's suppression of the truth of history. What, really, does the media fear? Punishment by the withdrawal of advertising revenue). That said, it is my opinion (which is also shared by Ilan Pappe and many well informed others of all faiths and none) that Zionism's success to date is due only 50 percent to its own efforts and resources. The other 50 percent is due to the divisions and impotence of the regimes and elites of the existing Arab Order, regimes and elites which are rightly perceived by their masses to be (more by default than design, I say) American-and-Zionist stooges. A truth is that the Arabs had an ace card which could have trumped all of Zionism's cards - OIL. The 1967 war was a war of Israeli aggression, not self-defense. If, after it, Arab leaders had been united and prepared to play the oil card, they could have changed the course of history. How so? Suppose Arab leaders had sent one of their number [ones] to the White House to say to the president, in private, behind closed doors, “If you don't get Israel back behind its borders as they were on the eve of the war, we'll turn off the oil.” What would the president (any president) have replied? If he had believed the Arabs were united and serious, he would have said, “Give me a few days and I'll do it”. The point being that the Arabs would not have had to turn off the oil taps and lose revenue because a credible threat to do so would have been enough. If the boot had been on the other foot - if the Zionists had been the Arabs - that's the way they would have played the game. The main difference between Zionist and Arab leaders is that the former always knew how to play the cards they had been dealt, the latter did not and do not. (The one exception was King Feisal. He was intending to unite the Arab and the wider Muslim world to play the oil card - he as good as put Kissinger on notice to that effect - and that, almost certainly, is why he was assassinated). It is, of course, true that since George “Dubya” Bush came to power, the neo-cons have been calling most of the policy shots in America. But also true is that many of the neo-cons are hardest core Zionists. In my analysis it was these Zionists, led by Richard Perle and Paul Wolfowitz, who were the prime pushers for war with Iraq. And their main concern was not oil, but creating a situation in which the Zionist state of Greater Israel would remain forever the unchallenged and unchallengeable superpower of the region. We know from their own revealed documentation (their briefing paper to incoming Israeli Prime Minister Netanyahu, for example) what their strategy was and is….. To take out Saddam Hussein, to roll back Syria and then to go for the kill - regime change - in Iran. That, I believe, is the strategy now unfolding. Is there a possibility of a US or Israeli attack on the Islamic republic? If yes, what do you think the consequences will be? An attack on Iran is not a “possibility” or even a probability. It is a certainty (assuming only that Cheney and the neo-cons, Zionist and others, remain in command and control of US policy). The only thing that has changed in recent months is the justification the Bush regime (more totalitarian than democratic) will give for an attack. Because it's not completely stupid, the Bush regime has realized that its propaganda campaign to convince public opinion in America and throughout the Western world that Iran poses an imminent nuclear weapons threat has failed. Put another way, many if not most Americans and virtually all Europeans now understand that the war on Iraq was justified by a pack of lies about Saddam Hussein's military strike capabilities and intentions. American and European public opinion will not buy another (and actually very similar) pack of lies to justify war on Iran. So the Bush regime has had to change its story to sell the need for an attack on Iran. The new story, now being developed, is that Iran is to blame for many of America's troubles and casualties in Iraq. In other words, and as Seymour Hersh has noted, the Bush regime is in the process of REDEFINING THE WAR IN IRAQ (and Afghanistan) AS A STRATEGIC BATTLE BETWEEN THE UNITED STATES AND IRAN. The final justification for an actual attack on Iran will include the line that in Iraq (and Afghanistan) “it's the Iranians who are killing our boys.” This will enable the Bush regime to present American soldiers and so America as the victim (of the “axis of evil” - now minus North Korea? - controlled by Iran's leaders). What form will an American attack on Iran take? The most likely scenario is a massive, devastating air attack with conventional bombs and missiles with the aim of wiping out, in two or three days (the Americans will hope), the Revolutionary Guards and all of Iran's defense and counter-attack capabilities (weapons, communications, everything). It will be a massive attack because the Americans will factor into the equation the possibility that Iran might retaliate by causing oil exports from the region to be blocked which, if it happened, could bring about the breakdown of the global economy. So the American attack will be designed to prevent Iran having the possibility of exercising this option. A reading of published material (including leaks from people with access to the inside circle of policy makers) invites the conclusion that Western and Mossad agents have been inside Iran for a long time gathering target coordinates and other related information. (Some months ago a German report, apparently confirmed, said that Germany's intelligence service had provided Israel with the passports of 300 dead Germans). When is an American air attack on Iran most likely? For two reasons I speculate that February/March and/or possibly April is most likely. The Bush regime needs time to complete the demonization of Iran (a process that might well include faking and planting evidence). Also at this time the primaries for the American congressional and presidential elections will be getting seriously underway and the Bush regime will be seeking to wrongfoot the Democrats by saying, “You can't oppose this attack/war because Iranians are killing our guys in Iraq.” (It's by no means impossible that Bush regime and/or Israeli agents will stage a terrorist attack to pin the blame on Iran as proof of Iran's “murderous activities” - a phrase Bush used in August when speaking to the national convention of the American Legion). 3. The US comes to Israel's aid. Why “especially in the Democratic-dominated Congress”? Unlike the Republican Party, the Democratic Party could almost not exist without Zionist lobby organized funding. An interesting observation on this was made some months ago by an eminent Jewish American, Norman Birnbaum who is professor emeritus at Georgetown University Law School. In an article published on the Open Democracy web site, he wrote: “The Democratic Party cannot hope to develop an alternative American foreign policy while retaining its present financial and intellectual dependence on the Israel lobby.” (I disagree with Birnbaum on one point. It's not an Israel lobby, it's a Likud lobby. A statement to that effect was made to me in private conversation by Shimon Peres in 1980, when he was the leader of the Labor Party and hoping to become Israel's next prime minister. Peres knew that a second term in office for Prime Minister Begin would see the creation of settlement facts on the ground in the occupied West Bank on a scale which would prevent any future Israeli government from withdrawing for peace out of fear of provoking a Jewish civil war). WMR has learned from US and foreign intelligence sources that the B-52 transporting six stealth AGM-129 Advanced Cruise Missiles, each armed with a W-80-1 nuclear warhead, on August 30, were destined for the Middle East via Barksdale Air Force Base in Louisiana. However, elements of the Air Force, supported by US intelligence personnel, successfully revealed the ultimate destination of the nuclear weapons and the mission was aborted due to internal opposition within the Air Force and US Intelligence Community. * The intended destination of the six nuclear missiles - the very latest technology which Israel does not yet possess - could only have been Israel. * Nuclear weapons cannot be moved without the authorization of the President. Implication? Either Bush knew and approved - possibly putting his signature on a piece of paper put in front of him by Cheney without knowing what he was signing; or Cheney had the necessary authority delegated to him by Bush. (Bush is, apparently, a very lazy man as well as a stupid man). A related matter….. What was the Israeli Air Force's mission when, on 6 September, it attacked a target in Syria? Latest information, (including that from the web site of the magazine Aviation Week & Space Technology), suggests to me that Israeli F15 and F16 jets were testing the effectiveness of the latest American (cutting edge) technology for blinding enemy radar. It, the “Suter airborne network attack system”, obviously works well because it allowed the Israeli planes to enter and operate in Syrian airspace without being detected by Syria's Russian-supplied state-of-the-art radar systems. (I note reports saying that Iran is worried because it has the same Russian-supplied defense system. Presumably the Russians are now working flat out against the clock to come up with a counter measure). What are the most likely consequences of an American or Israeli attack on Iran? Much will depend on Iran's response (if it is able to respond after an American “shock and awe” attack). In this interview I'm not going to speculate about Iran's possible responses, but I will say this much….. If it goes badly wrong for the Americans, I would not rule out the possibility that Israel (and possibly America) will launch nuclear strikes (drop nuclear bombs) on Iran. In Volume Two of my book I quote Ezer Weizman when he was Israel's defense minister telling me in private that Sharon was mad enough to nuke the entire Arab world! And in the Prologue to Volume One I quote Golda Meir telling me, in an on-the-record interview for the BBC's Panorama program when she was prime minister, that if ever Israel was in danger of being defeated on the battlefield, it would be prepared to take the region and the whole world down with it! The kind of madness indicated above is alive and well in Israel and Washington DC. (And possibly Paris under its new management). At a minimum an attack on Iran will set the stage for escalating and unending conflict, which could go all the way to World War III, destroying the global economy as events unfold. Arab and Muslim masses everywhere will be driven to new depths of anger but in the short term it is likely that their repressive regimes will keep the lid on violent protest. But for the longer term….. an attack on Iran will serve as the best possible recruiting sergeant for violent Islamic fundamentalism [extremism] and bring forward the day when the corrupt and impotent regimes of the existing Arab order will be toppled by people power. (The first real Arab revolution). Western and Arab governments are hoping that an attack on Iran would cause Iranians to rise up and overthrow “the Islamic regime”. In theory, and because there is a measure of discontent in Iran with the ways things are, that might be a possibility; but I think it much more likely that an attack would have completely the opposite effect - unite all Iranians behind their “regime”. What do you think of the US-Zionist alliance? I think I've said enough on this above. The only point I wish to add is that American administration support for the Zionist state [regime] of Israel right or wrong is not in America's own best interests. In fact it is the most serious threat to those interests. The only hopeful sign is that those of us of all faiths and none who are making this point in our books and on public platforms are beginning to make an impression on the ignorance of Western public opinion. How far do you think Zionism has tarnished the image of Judaism in the world? The major statement I make on the subject of Zionism and Judaism is that Zionism is destroying Judaism. THE KEY to understanding why there is conflict in and over Palestine, why a resolution of it has remained beyond the reach of politics and diplomacy and who must do what and why for justice and peace is knowledge of the difference between Judaism and Zionism. Zionism's ability to suppress informed and honest debate is due, mainly, to its success in making the Judeo-Christian or Western world believe that Judaism and Zionism are one and the same thing. This enables Zionism to assert that criticism of the Zionist state of Israel is a manifestation of classical anti-Semitism (prejudice against and even hatred of Jews just because they are Jews). The truth is that Judaism and Zionism are total opposites. JUDAISM is the religion of Jews (not “the Jews” because not all Jews are religious), and, like Islam and Christianity, Judaism has at its core a set of ethical principles and moral values. ZIONISM is a secular, colonialist ideology which makes a mockery of, and has contempt for, the ethical principles and moral values of Judaism. The evidence which supports this statement begins with the fact that Israel was created mainly by Zionist terrorism and ethnic cleansing. The truth is not only that Zionism and Judaism are total opposites, but that the return of Jews to the land of biblical Israel by the efforts of man (one possible but woefully inadequate definition of Zionism) was PROSCRIBED by Judaism…. Also a fact, unknown to this day to almost all Gentiles and Jews, is that many if not most of the Jews who went to Palestine in answer to Zionism's call had no biological connection to the ancient Hebrews. The incoming Zionist Jews were mainly foreign nationals of many lands, descended from those who became Jewish by conversion to Judaism centuries after the fall of the ancient Jewish kingdom of Israel and what is called the “dispersal” into “oblivion” of its people. The notion that there are two entire peoples with an equally valid claim to the same land is an historical nonsense. The relatively few Jews with a valid claim were, are, the descendants of those who stayed in Palestine through everything. They numbered only a few thousand at the time of Zionism's birth; they regarded themselves as Palestinians; and they were fiercely opposed to Zionism's colonial enterprise - because they rightly feared that it would make them as well as the incoming, alien Zionist Jews enemies of the Arabs among whom they had lived in peace and security. Arabs and other Muslims have always known the difference between Judaism and Zionism. Throughout much of their history, Arabs and other Muslims were the best protectors of Jews - as Iran in terms of its own Jewish community still is today! It was Zionism's colonial enterprise that poisoned the relationship, but not to the point at which Arabs and other Muslims blame all Jews for Zionism's crimes. (As President Ahmadinejad has said, and I often say myself, the extermination of Jews in Europe was a European crime for which, in effect, the Arabs were punished). Why is it so important for the citizens of the nations of the Judeo-Christian or Western world to be informed of the difference between Judaism and Zionism? Knowledge of the difference is the explanation of (a) why it is perfectly possible to be passionately anti-Zionist (opposed to Zionism's colonial enterprise) without being in any way, shape or form anti-Semitic; and (b) why it is wrong to blame all Jews for the crimes of the few. The significance of (b) above is in the following. Though still suppressed, classical anti-Semitism is on the rise throughout the Judeo-Christian world in which most Jews live. It is happening in response to Israel's arrogance of power and the correct perception of Israel as the oppressor. The more it becomes apparent that Israel is the obstacle to peace on any terms most Palestinians and other Arabs and Muslims could accept, the more this antipathy to all Jews will grow, with the real danger that it will break out, become unsuppressed, and manifest itself as violent anti-Semitism. It's my Gentile view, which I know is shared in private by some eminent Jews, that Holocaust II (shorthand for another great turning against Jews) WILL happen at a foreseeable point in the future unless the Judeo-Christian world is made aware of the difference between Judaism and Zionism. It's also my view that if the monster of classical anti-Semitism does go on the rampage again, it might well start its journey in America. What is your opinion about the recent Zionist move to cut off fuel supplies to Gaza? Zionism is not remotely interested, and never has been, in peace on any terms the Palestinians and the vast majority of Arabs and other Muslims everywhere could accept. Zionism's philosophy of doom is “them or us”. Zionism's end-game strategy for a solution to the Palestine problem now leaves nothing to the imagination. Zionism's military and political leaders in Israel (and their lobbyists in America) believe that by means of brute force and reducing them to abject poverty, they can break the will of the Palestinians to continue the struggle for their rights…. The assumption being that, at a point, and out of total despair, the Palestinians will be prepared to accept crumbs from Zionism's table in the shape of two or three Bantustans, or, better still, will abandon their homeland and seek a new life in other countries. The question that's almost too awful to think about is something like this: What will the Zionists do when it becomes apparent even to them that they can't destroy Palestinian nationalism with bombs and bullets and brutal repressive measures of all kinds? My guess (Ilan Pappe agrees with me) is that they, the Zionists, will go for a final round of ethnic cleansing - to drive the Palestinians into Jordan and beyond. That, I fear, will be Zionism's final solution to the Palestine problem. If that happens, the West Bank will be turned red with blood, mostly Palestinian blood. Honest reporters will describe it as a Zionist holocaust. Do you think the US government is using the terrorist activities in the world in order to create fear of Islam? And do you think there is a clash of religions in the world? Yes. The Bush regime is playing the fear card to enable it to bring in legislation, including authoritarian powers for the president, which is eroding the democratic freedoms and human rights of the American people. (There are some American commentators, including former members of the Establishment, who believe that what we are witnessing in the US is the emergence of new fascism). There is a respectable case for saying that the US (I mean its political, financial and military Establishment) needs an enemy (as Zionism does), and that having lost the “evil empire” of the Soviet Union, Islam is the necessary new enemy. The argument in support of this contention can be simply stated. The Military Industrial Complex is the single biggest creator of wealth and jobs, but it depends for much of its funding for research and development and production on government funding - the taxes citizens pay. Without an enemy and a perceived threat, government would not be able to justify its vastly disproportionate spending of public money on the war machine. A question I often ask on public speaking platforms is this: Given that President Bush is the best recruiting sergeant for violent Islamic fundamentalism, why is it so? Is it (a) because he is ignorant of history and doesn't know what he is doing, and is, in a word, stupid; or is it (b) because he, or those who pull his strings, want a Clash of Civilizations, Judeo-Christian v Islamic? In private conversation I have put this question to 20 real experts of all faiths and none. Almost all of them, 18, said the answer was (a) and (b). My own view is that the mad men in America might not want a Clash of Civilizations but do not care if it happens as a consequence of imposing their will on the nations of the Arab and wider Muslim world. At the present time I believe we are on course for a Clash of Civilizations. How well can the Muslims be integrated into the European community despite the Western Islamophobia? If the question means is there a safe and secure future for Muslims who have become (or want to become) citizens of the European nations, my answer has to be - I'm not sure. If American-led Western policy does not change - i.e. if it continues to fuel violent Islamic fundamentalism - Islamophobia will most likely turn violent, and Muslims in the European nations (and America) will be in peril. Regarding Turkey's probable integration into the formal institution of the European Union, I can see only problems ahead - i.e. as a consequence of that integration. Despite current French and other objections, Turkey probably will be accepted (with America's blessing) as a full member because it is, behind the democratic window dressing, a military dictatorship. Turkey will thus be viewed by European governments (and the one in Washington DC) as not only the acceptable face of Islam but also as a wall or fortress - a strategic asset in the confrontation with “militant Islam”. Put another way, Turkey would be required more than ever to do the West's bidding, and that, surely, would put its government and military on a collusion course with most of its own people….? IN CONCLUSION I repeat….. My view that an attack on Iran is a certainty not a possibility or a probability assumes that Cheney and his neo-cons, including the Zionists, retain their ability to call the policy shots. If President Bush listens to others, it might not happen. What, if anything, Iran could do to prevent an attack is a very good question.